The Land of the Dreamweavers booth of the Municipality of Tboli and the provincial government of South Cotabato bagged top honors in the recently held 2014 Philippine Travel Mart at SMX Convention Center in SM Mall of Asia, Pasay City on September 5-7. 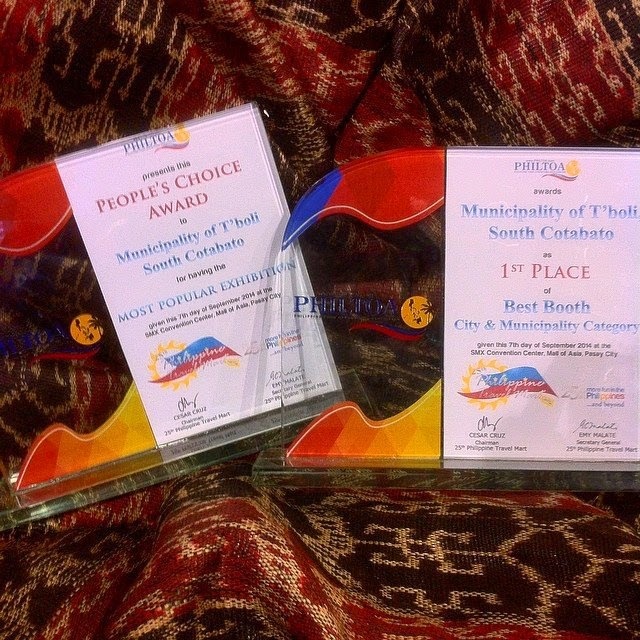 The booth which features "The Crown Jewel of the South" the Municipality of Tboli as an emerging destination, won 1st Place in the Best Booth competition and the People's Choice Award for having The Most Popular Exhibition. It showcased different adventures one can experience in Tboli and the Province of South Cotabato, our province's nature destinations and the rich culture of the Tboli tribe. Photo from The Land of the Dreamweavers Facebook Page. The Philippine Travel Mart is the largest travel and trade show organized by the Philippine Tour Operators Association (PHILTOA) together with the Department of Tourism. Participants ranging from airlines, hotels and resorts, and travel agencies all came together to sell attractively priced packages with the goal of promoting tourist destinations in the Philippines.